There's no sophomore jinx here; Mindwarp Chamber's second full-length album Supernova is just as terrific as their debut Delusional Reality. Significantly, Supernova establishes the Chicago-based band as an American progressive metal band to be reckoned with, one that can stand easily beside peers like Dream Theater. While there are moments, Supernova does not seem as heavy as their previous work, and also shedding much of the power metal nuances. Yet, you still recognize the power metal edge when you hear Out of Spite. Nevertheless, when listening to Last Ember Fades or Closer to Heaven you will find songs of more expansive intrigue, where the compositions broaden and the musicians have the latitude to excel. This strong sense of inventiveness is merged with a healthy does of infectious melody as found within the heaviness of the aforementioned Out of Spite, but certainly throughout. This intrigue, inventiveness, and beauty of melody finds its best integration in the closing piece, The Final Act. Filled with twists and turns, and clever diversions. The Final Act also displays the effortless balance Mindwarp Chamber gives to every musician's performance. Supernova is a superbly well-rounded platter of progressive metal, a worthy successor to their premier and must have for prog fans everywhere. Very recommended. 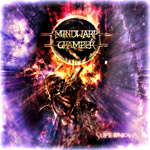 Mindwarp Chamber's Supernova is a superbly well-rounded platter of progressive metal, a worthy successor to their premier and must have for prog fans everywhere.